At $430 million Mike Trout has been called one of Major League Baseball’s underpaid players. Where are we going? To why baseball salaries are sometimes too low. 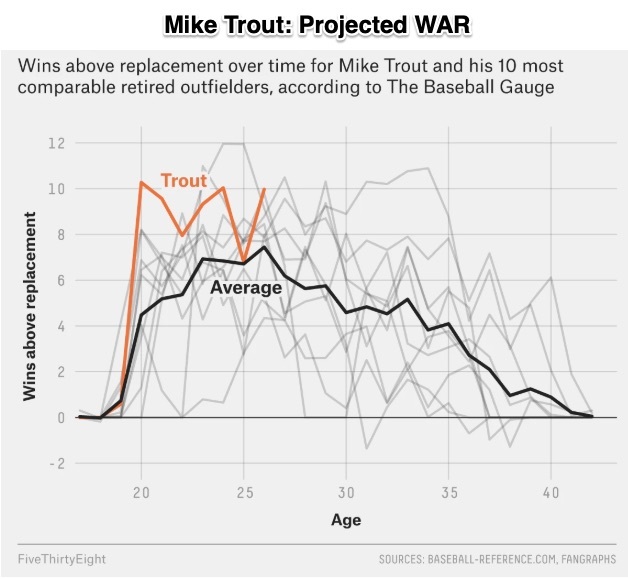 From a slightly different perspective, we can quantify Mike Trout’s value through his WAR and AAV. His WAR–Wins Above Replacement–tells us how much he helped his team beyond the norm. An AAV–Average Annual Value–is an average that is supposed to avoid the misleading message of a middle number that says nothing about the highs and the lows. Using his WAR and AAV, we can again see Mike Trout’s record. His 54.1 WAR is close to 50% higher than the 35.7 that was calculated for the second ranked player. Also, at $36 million, he had the highest AAV. Still though, the numbers that display his value far exceed how much his pay tops the other players. His AAV, for example, is just 5% (or so) more than the second ranked player. For that reason, he is considered underpaid. Slightly similarly, lower paid players are also underpaid. Most new young players receive close to the $550,000 League minimum during their first year. When the second year arrives, still the salaries are low (for baseball). Years ago, after a strong rookie season, even Mike Trout got only $20,000 above the minimum. Last year, 26 year-old Aaron Judge and 24 year-old Luis Severino led the Yankees. Their pay? League minimums. MLB controls the salaries of rookie players. The result is what some call suppression. Players arrive, and some fare well. But their pay does not reflect their excellence because they lack the power of the market. However, they do know that as free agents, their salaries could soar. Essentially, we are comparing monopsony and the market. A monopsony is like a monopoly. Only here, we have a single buyer (or very few) who wield huge pricing power. Because the MLB owners have labor market monopsony power, rookie players’ salaries are not as high as they might be. So, whether looking at monopsony or monopoly, without the market we wind up with some distortion from unilateral power. With baseball that distortion is a disconnect between performance and salary…even for Mike Trout. My sources and more: Thanks to my friend Mike S. for recommending today’s topic. If you want to read more about Mike Trout’s salary, do start with this Washington Post article. and then Fivethirtyeight, baseballamerica, and WSJ. Next, Slate for salaries, and The Sports Economist for monopsony, are also possibilities. Please note that the content of this post was edited after publication to state more clearly why Trout is called underpaid.